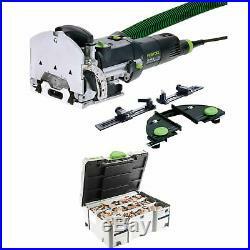 Festool 574432 Domino Joiner Set with 498899 Domino Beech Tenons and Cutters. Brand New in Original Packaging. 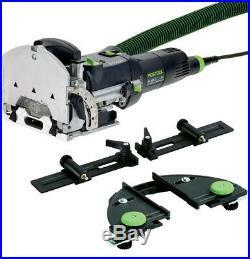 Festool Domino Joiner DF 500 Q Set. 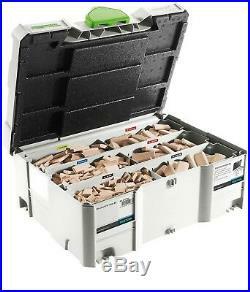 Festool 498899 Assorted Domino Beech Tenons and Cutters in T-Loc Systainer. Get the DOMINO Joiner DF 500 Q Set (including trim stop and cross stop) for fast, easy and strong mortise and tenon joining. The Festool Domino is the only tool that brings true mortise and tenon joinery to the palm of your hand and out of the workshop. The Domino utilizes a drill bit style cutter that spins, while oscillating, creating mortises in easily adjustable sizes from 4-10mm in width and up to 50mm in depth. This unique cutter style, coupled with many versatile features, quickly adapting the tool to the job, makes mortise and tenon joinery fun, fast and easy. The Domino’s rapid, repeatable mortising action and easy changeover between tenons and cutters (in only seconds) make tenon joinery faster, easier, and more accurate than ever before. The Domino tenons fit perfectly into the mortise helping create a strong, secure and resilient joint. The Domino has made mortise and tenon joinery repeatable, consistent and mobile. No longer is joinery a tedious and dubious task requiring many hours working with large shop equipment. (1) Domino Cutter (5mm). (1) Plug-it Power Cord. (1) T-Loc Systainer 2. The spiral cutter rotates and oscillates to create perfect mortises. Adjust the width of the mortise with the turn of a dial. Adjusting the width of the mortise allows for easier alignment when joining panels. With an adjustable fence angle, retractable stop flaps, adjustable cutter height with step gauge, and precise mortise depth stop, the DOMINO joiner enables precise mortise placement and spacing. The fence creates angled mortises from 0-90° with positive stops at 22.5°, 45°, 67.5°. The Q-Set DOMINO has quick, precise adjustment for five different mortising depths, relative to the size of the tenon required for the application. 7 different step positions for different material thicknesses provide fast and easy fence height adjustment. Your mortises are clean and ready for glue when the Domino is used in combination with a dust extractor. Proper dust extraction greatly extends cutter life. Carbide Tip Spiral Bit. The durable, long-lasting bit withstands 5,000-14,000 joints depending on material. Rapid bit change means you can change a bit in under 30 seconds to match your desired tenon size. Mortise width adjustment with the turn of a dial. Adjust mortise width to easily align when joining panels. Pivoting fence allows you to create angled mortises from 0-90°. 0-90° angled mortises have positive stops at 22.5°, 45°, 67.5°. The Festool 498899 Assorted Beech Wood Domino Tenons make strong floating tenons that create a tight, sturdy hold in mortise and tenon joints. They are perfect for crafting cabinets, furniture, and frame work around windows and doors. The long, flat shape and embossed glue pockets of these beech wood tenons enables them to hold glue on both the edge and the face and to stay in one position without rotating once you’ve joined them with a mortise. You can rest assured that your surfaces will be flat and free of pitches and bumps because these Festool Tenons will not expand or telegraph through wood material. These assorted tenons are 100% solid beech hardwood and have dimensions 4 x 20mm (450), 5 x 30mm (225); 6 x 40mm (150); 8 x 40mm (100); 8 x 50mm (75); 10 x 50mm (60). The set also includes cutters in sizes D4mm (1), D5mm (1); D6mm (1); D8mm (1); D10mm (1) so you can cut the tenons to the custom size you need. All materials come in a T-LOC Systainer for organization. 100% solid Beech wood tenons. Flat design prevents rotation. 6 different tenon dimensions. 4 x 20mm Tenons (450). 5 x 30mm Tenons (225). 6 x 40mm Tenons (150). 8 x 40mm Tenons (100). 8 x 50mm Tenons (75). 10 x 50mm Tenons (60). 1 x D4mm Cutter. 1 x D5mm Cutter. 1 x D6mm Cutter. 1 x D8mm Cutter. 1 x D10mm Cutter. In the Continental US Lower 48 states only. We cannot declare items at a lesser value or as gifts. Territories and International orders. F There are product categories which are not returnable due to hygienic or sanitary as required by manufacturers. In an event where there is an error regarding a price error or description, we will notify you ASAP. Items removed from their’blister-pack’ display packaging are non-refundable. The item “Festool 574432 Domino Joiner Set with 498899 Domino Beech Tenons and Cutters” is in sale since Monday, November 12, 2018. This item is in the category “Home & Garden\Tools & Workshop Equipment\Power Tools\Routers & Joiners”. The seller is “asavings” and is located in Brooklyn, New York. This item can be shipped to United States, Canada, United Kingdom, China, Mexico, Germany, Japan, Brazil, France, Australia, Denmark, Romania, Slovakia, Bulgaria, Czech republic, Finland, Hungary, Latvia, Lithuania, Malta, Estonia, Greece, Portugal, Cyprus, Slovenia, Sweden, South Korea, Indonesia, Taiwan, South africa, Thailand, Belgium, Hong Kong, Ireland, Netherlands, Poland, Spain, Italy, Austria, Bahamas, Israel, New Zealand, Singapore, Switzerland, Norway, Saudi arabia, Ukraine, United arab emirates, Qatar, Kuwait, Bahrain, Croatia, Malaysia, Colombia, Panama, Jamaica, Barbados, Bangladesh, Bermuda, Brunei darussalam, Bolivia, Ecuador, Egypt, French guiana, Guernsey, Gibraltar, Guadeloupe, Iceland, Jersey, Jordan, Cambodia, Cayman islands, Liechtenstein, Sri lanka, Luxembourg, Monaco, Macao, Martinique, Maldives, Nicaragua, Oman, Peru, Pakistan, Paraguay, Reunion, Viet nam, Uruguay.